Alzheimer disease is a disorder of the brain. It leads to a loss of the ability to think, reason, and remember. It worsens over time and will lead to severe impairment. Alzheimer dementia is when the disorder has made it impossible for people to care for themselves. 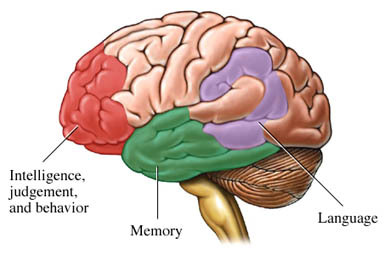 These changes often begin in areas of the brain that store memory. This damage may start several years before the first symptoms appear. There are no signs in the earliest stages. At this point there are changes in the brain but not enough to cause signs or symptoms. The speed of progression will vary from person to person but can happen over several years. Develop a network of family and friends for help. Even basic steps like groceries. Ask medical team for local support options. Seek out medical services for extra support. This can include overnight care. Look for support groups online or in person. They may provide more options. Albanese E, Dangour AD, Uauy R, et al. Dietary fish and meat intake and dementia in Latin America, China, and India: A 10/66 Dementia Research Group population-based study. Am J Clin Nutr. 2009;90(2):392-400. Alzheimer dementia. EBSCO DynaMed Plus website. Available at: https://www.dynamed.com/topics/dmp~AN~T114193/Alzheimer-dementia . Updated August 21, 2017. Accessed October 2, 2017. Treatment of Alzheimer's disease. National Institute on Aging website. Available at: http://www.nia.nih.gov/alzheimers/publication/alzheimers-disease-medications-fact-sheet. Accessed October 2, 2017. Anstey KJ, Mack HA, Cherbuin N. Alcohol consumption as a risk factor for dementia and cognitive decline: Meta-analysis of prospective studies. Am J Geriatr Psychiatry. 2009;17(7):542-555. Carillo MC, Blackwell A, Hampel H, et al. Early risk assessment for Alzheimer's disease. Alzheimers Dement. 2009;5(2):182-196. Gidoni R, Benussi L, Paterlini A, Albertini V, Binetti G, Emanuele E. Cerebrospinal fluid biomarkers in Alzheimer’s disease: The present and the future. Neurodegen Dis. 2011;8(6):413-420. Green RC, Cupples LA, Go R, et al. Risk of dementia among white and African-American relatives of patients with Alzheimer disease. JAMA. 2002;287(3):329-336. Hampel H, Frank R, Broich K, et al. Biomarkers for Alzheimer’s disease: Academic, industry, and regulatory perspectives. Nat Rev Drug Discov. 2010;9(7):560-574. Hayden KM, Welsh-Bohmer KA. Epidemiology of cognitive aging and Alzheimer’s disease: Contributions of the Cache County Utah study of memory, health, and aging. Curr Top Behav Neurosci. 2012;10:3-31. Neugroschl J, Sano M. An update on treatment and prevention strategies for Alzheimer’s disease. Curr Neurol Neurosci Rep. 2009;9(5):368-376. Ruitenberg A, van Swieten JC, Wittemen JC, et al. Alcohol consumption and risk of dementia: The Rotterdam Study. Lancet. 2002;359(9303):281-286. 1/8/2010 DynaMed Plus Systematic Literature Surveillance. Available at: https://www.dynamed.com/topics/dmp~AN~T114193/Alzheimer-dementia : Snitz BE, O'Meara ES, et al. Ginkgo biloba for preventing cognitive decline in older adults: A randomized trial. JAMA. 2009;302(24):2663-2670. 5/4/2012 DynaMed Plus Systematic Literature Surveillance. Available at: https://www.dynamed.com/topics/dmp~AN~T114193/Alzheimer-dementia : Buchman AS, Boyle PA, et al. Total daily physical activity and the risk of AD and cognitive decline in older adults. Neurology. 2012;78(17):1323-1329. 9/3/2014 DynaMed Plus Systematic Literature Surveillance. Available at: https://www.dynamed.com/topics/dmp~AN~T114193/Alzheimer-dementia : Wippold FJ, Brown DC, Broderick DF, et al. American College of Radiology (ACR) Appropriateness Criteria for dementia and movement disorders. Available at: http://www.acr.org/~/media/ACR/Documents/AppCriteria/Diagnostic/DementiaAndMovementDisorders.pdf. Updated 2014. Accessed September 3, 2014. 10/17/2016 DynaMed Plus Systematic Literature Surveillance. Available at: https://www.dynamed.com/topics/dmp~AN~T114193/Alzheimer-dementia : Arvanitakis Z, Capuano AW, et al. Relation of cerebral vessel disease to Alzheimer's disease dementia and cognitive function in elderly people: a cross-sectional study. Lancet Neurol. 2016 Aug;15(9):934-943.